Fleetwood owned and registered but did not fish from the port. 28.11.1928: Launched by Cook, Welton & Gemmell Ltd, Beverley (Yd.No.511) for Fleetwood Steam Fishing Co Ltd, Fleetwood as LORINDA. 19.12.1928: Registered at Fleetwood (FD182). 22.12.1928: Completed (Sir George E. J. Moody, Grimsby, manager). Fishing from Grimsby. 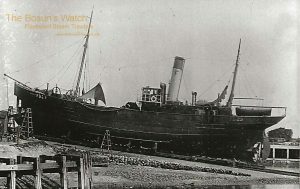 26.1.1934: Off Dyrafjord, west coast of Iceland with steam trawler EBOR WYKE (H78) searched for survivors amongst wreckage of trawler SABIC (GY58) which foundered following collision with trawler EUTHAMIA (GY716). 4.9.1939: Requisitioned for war service as a minesweeper (P.No. NR) (Hire rate £155.3.0d/month). 12.9.1939 (Regd): Sold to Boyd Line Ltd, Hull. 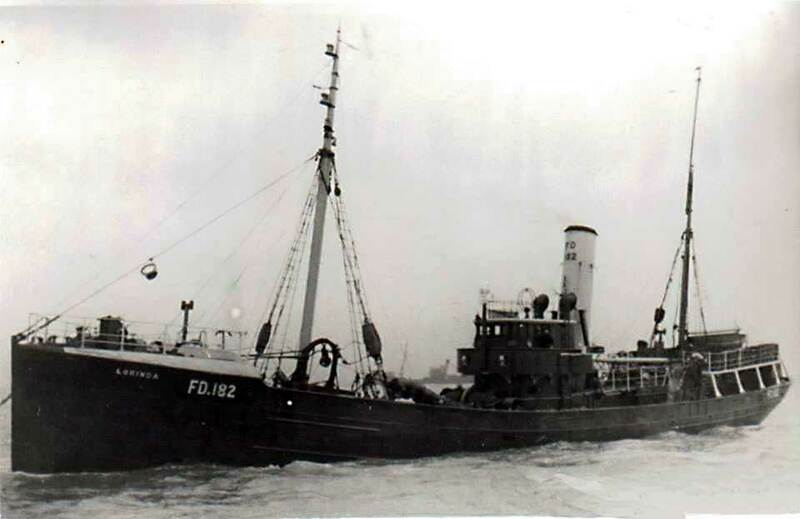 10.10.1939 (Regd): Sold to Shire Trawlers Ltd, London (William A. Bennett, manager). 18.10.1939: Registered at Grimsby (GY220). 20.8.1941: Foundered off Freetown, Sierra Leone after fire in machinery spaces. 26/08/2008: Page published. Three updates since then. 17/09/2017: Removed FMHT watermark from image. 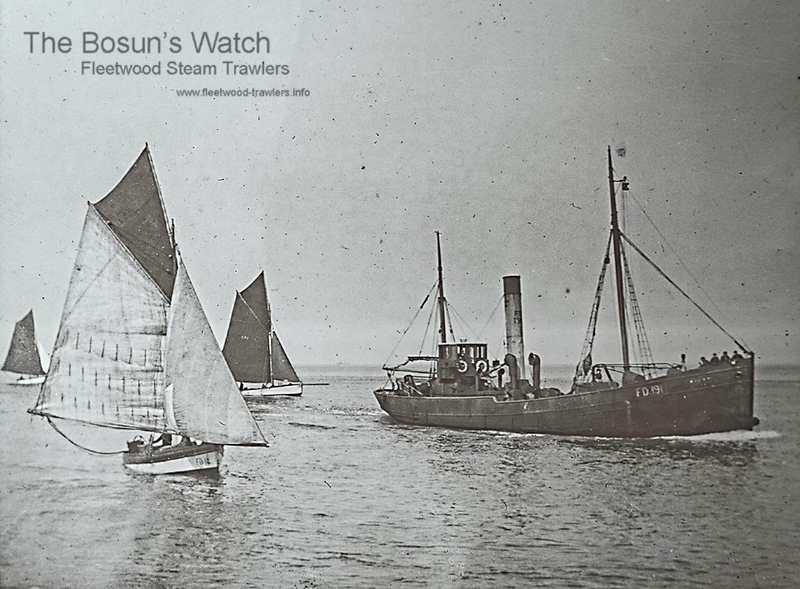 This entry was posted in Lost Vessels, Steam Trawlers, Steamers (Picture) and tagged Fleetwood SFC, Lost on December 26, 2008 by Fred Smith. 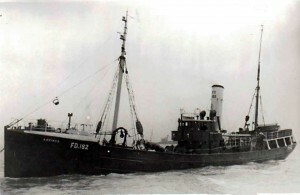 15.1.1910: Launched by Cochrane & Sons Ltd, Selby (Yd.No.458) for Fleetwood Steam Fishing Co Ltd, Fleetwood as LOIS. 10.2.1910: Registered at Fleetwood (FD113). 2.1910: Completed (George E. J. Moody, Grimsby, manager). 9.1.1915: Requisitioned for war service as a minesweeper (1-6pdr, W/T) (Ad.No.645). Fitted as Leader. 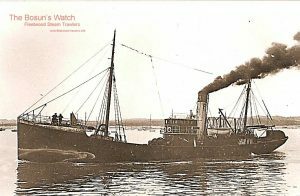 28.4.1917: Three miles ENE of Start Point at 1730 sighted steamer MEDINA (12350grt/1911) stopped and blowing whistle (torpedoed by UB31). Alerted destroyer HMS WALPOLE (D.41). At 1825 MEDINA sank in position 50.13N 03.32W. About 8 miles SSW of Dartmouth at 1855 took onboard 94 survivors picked up by Brixham smack ONWARD (BM265) and took in tow three lifeboats. At 1930 landed survivors at Dartmouth. 19.5.1917: At 1435 in approx position 50.30N 3.10W engaged German submarine. Post 12.3.1919: Returned to owner at Fleetwood. 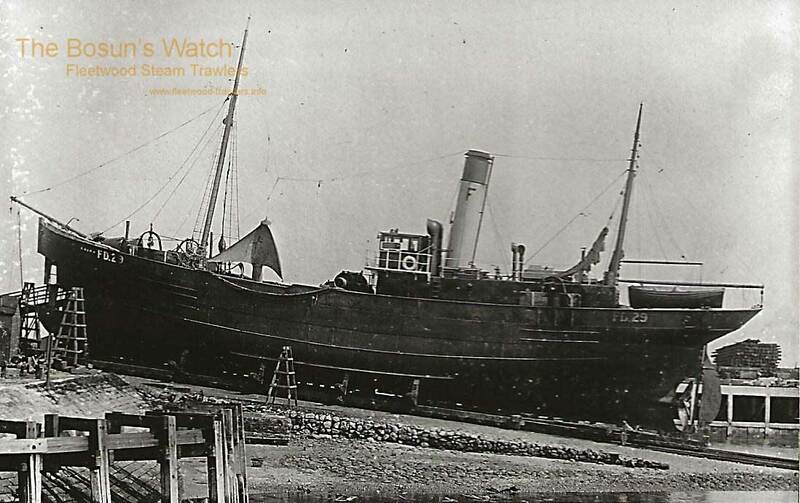 12.5.1921: Stranded Blackgang, Isle of Wight. Crew taken off by local boat. Refloated after patching but grounded again 50yds out and further damaged. Became a total loss. 22.9.1921: Fleetwood registry closed “Vessel wrecked 12/5/21”. 9.1.1915: Commissioned at Fleetwood. 14.1.1915: Arrived Devonport. Fitted with WT (Call sign YID) and Hotchkiss 6pdr gun (Ser.No.645)(Ad.No.961). Fitted as Leader. 6.2.1915: Allocated Unit No.63 – No.1 Patrol based Dartmouth (Sub Lieut. C.L. Divine RNR). 4.1915: Re-appointed Unit 63 – Division C based Plymouth (Lieut. A.A. Crowther RNR). 1.10.1916: Based Devonport (Lieut. A.A. Crowther RNR). 13.3.1917: At Devonport. Southern Patrol Temporary Div.1. 1.1.1919: Port for landing Stores, Armament and Moveable Fittings – Devonport. Port for Demobilising Personnel – Fleetwood. 1919: Returned to owners at Fleetwood. 26/12/2008: Page published. 6 updates since then. 13.1.1898: Launched by Earle’s Shipbuilding & Engineering Co Ltd, Hull (Yd.No.431) for Fleetwood Steam Fishing Co Ltd, Fleetwood as LILY. 20.8.1898: Registered at Fleetwood (FD192), George E. J. Moody appointed manager. 11.1906: Sold to Société des Pêcheries de l’Océan, Arcachon (Ch. Olivari, manager). 1906: Registered at Bordeaux as GRÈBE. Pre 1915: Sold to Soc. Immobiliére du Moulleau et des Pêcheries de la Océan, Bordeaux (M. Camproger, manager). Pre1927: Sold to Soctiété des Pêcheries de l’Ocean, Arcachon (Ch. Oliveri, manager). Pre1930: Sold to N. Melchiorre di P., Rome. Registered at Rome as GLORIA. 1949: Sold for breaking up. This entry was posted in Steam Trawlers and tagged Fleetwood SFC on December 25, 2008 by Fred Smith. 21.1.1905: Launched by Earle’s Shipbuilding & Engineering Co Ltd, Hull (Yd.No.491) for The Fleetwood Steam Fishing Co Ltd, Fleetwood as LAURA. 9.2.1905: Registered at Fleetwood (FD29), George E. J. Moody, Grimsby appointed manager. 1.1.1914: Tonnage altered to 110.49net under provision of Merchant Shipping Act 1907. 28.10.1914: Sank the MARY STANLEY (FD117) in collision; crew rescued. 3.1917: At Fleetwood. Fitted with Hotchkiss 6pdr gun (No.1254); complement increased by two gunners. 1.1918: At Fleetwood landed a catch which grossed £6,100 – a new port record. 1919: New boiler fitted (made 1897). 1919: Released. 1921: Sold to Rodriguez Hermanos Rincon, Corunna (BoT approval 16.12.1931). 12.1921: Registered at Corunna as FERNANDO. Post 1945 pre 1952: (FATE)? 25/12/2008: Page published. 2 updates since then. This entry was posted in Steam Trawlers, Steamers (Picture) and tagged Fleetwood SFC on December 25, 2008 by Fred Smith. 10.1.1898: Launched by Earle’s Shipbuilding & Engineering Co Ltd, Hull (Yd.No.430) for Fleetwood Steam Fishing Co Ltd (64/64), Fleetwood as KITTY. 29.7.1898: Registered at Fleetwood (FD191), George E. J. Moody, Grimsby designated manager. 22.11.1905: While stormbound in Tobermory, at about 6.00pm two crew members, W. Robertson (23) and John Shuttleworth (20), took boat away to visit CITY of BRISTOL (FD207) anchored near by. By midnight they had not returned and the whistle was blown repeatedly; there was no response. 23.11.1905: In the morning the CITY of BRISTOL was hailed and it was discovered that nothing had been seen of the boat or the two men It was assumed that the boat had become unmanageable and driven by the gale had drifted seawards. Search parties were organised and scoured the shore of the island of Calvey and in the vicinity of Rhubha nan Gall lighthouse. With Customs Officers and police onboard, weighed and proceeded to search entrance to Loch Sunart, where two oars and a sou’wester were recovered. Assumed that both men had perished, aborted trip and set course for Fleetwood. 24.11.1905: At about 8.30pm entered Wyre Dock. 29.12.1905: Reported that body of John Shuttleworth had been recovered. 30.4.1908: Sold to Joseph Johnston & Sons Ltd, Montrose (William Douglas Johnston, Junr, designated manager). 11.5.1908: Registered at Montrose (ME226). 1913: Sold to John Wright & Richard W. Mason, Fleetwood. 1913: Sold to The Brooklyn Fishing Co Ltd, Fleetwood. Richard W. Mason designated manager. 3.3.1913: Registered at Fleetwood (FD179). 12.1916: Sold to George Frederick Sleight, Grimsby. 9.5.1917: Stopped by U-boat (UC42) 25 miles ENE of St. Abb’s Head, Skipper and Chief Engineer made prisoner. Sunk by explosive charge in position 56.11.39N 01.45.00W. 24/12/2008: Page published. 2 updates since then. This entry was posted in Lost Vessels, Steam Trawlers, War Losses and tagged Brooklyn SFC, Fleetwood SFC, Lost, War Loss on December 24, 2008 by Fred Smith.